2 days back Nokia stepped into the dual SIM mobile segment with the launch of its first dual SIM mobile phones Nokia C1 and C2. Now Nokia has released its first much awaited phone based on Linux Maemo operating system in India. 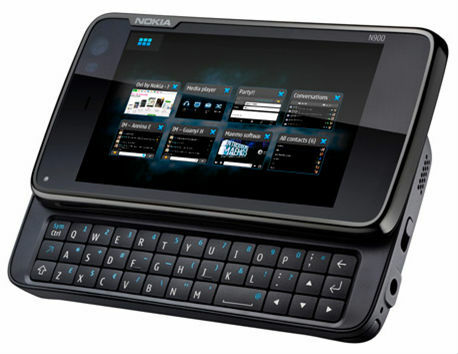 Nokia N900 – the internet tablet is a feature rich phone with 3.5 inch touchscreen display and QWERTY keyboard. It comes with 5 megapixel camera with Carl Zeiss lens, LED flash with 3x digital zoom and GPS. Nokia N900 is based on Linux Maemo 5 operating system and is powered by ARM Cortex A8 600 MHz processor. It supports full multitasking ability. It comes with 32 GB of memory and it can be expanded up to 45 GB. Other features of the phone includes Wi-Fi, 3G, FM transmitter, Bluetooth, TV-Out, Adobe Flash 9.4 support and full screen browsing. Seems these days everyone did ‘NO KIA’ to Nokia so to compete they had to launch new phones. That’s why they released three new mobiles in a month. You are right Ankit. Most of the users are going for Samsung mobiles these days at least here in Chandigarh. I love Nokia phones. I’m a gadgets freak and i have 3-4 handsets of all top companies but i love the Noika most. I’m an Indian and its ruggedness drive me crazy. I know Nokia is very late in dual sim phones but instead of it its the No1 company here in India and manufacturing record mobile per year. I dont think this phone is any better than 5800 or n97 , its just too bulky . It may be bulky, but the performance, speed are very high than N97 and any other symbian OS based Nokia mobiles.